today i want...: Drinks on Me! I'm not much of a drinker. Not that I have any issues with alcohol, I'd just rather spend my money on something more important... like shoes. 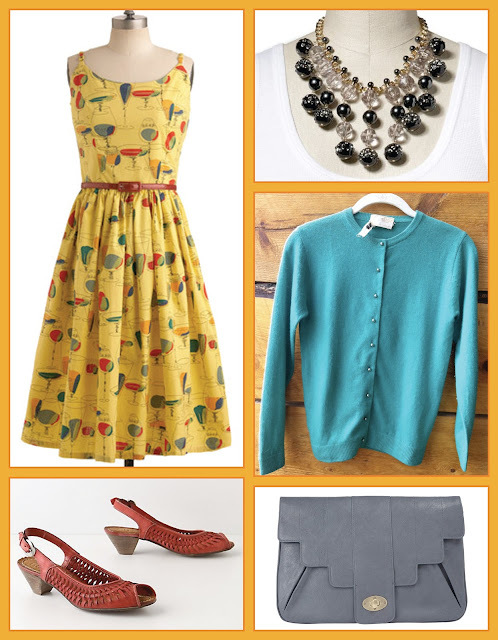 Regardless, I am all about this super cute retro print! As if the print wasn't enough, Betty Page Clothing even made it a super duper ladylike length (a major plus when you're a giant like me) aaaaaaand gave it a ultra feminine scoop front and back. Totally Fabulous. If it were me though, I'd lose this belt. The glittery vinyl takes it way into cheesy rockabilly territory. I'd swap it out for a simple suede skinny for daytime or patent leather for a dressier look.